There is something to be said about sticking to tradition – and that is why I put this menu together for you. Start with a very easy to make Caesar Salad, add the thickest, juiciest, biggest T-Bone sSeak, grilled to perfection, serve with it Baked Potatoes with a special twist to the usual recipe, try a little change for Corn on the Cob and finish your favourite guy off with an incredible Triple Citrus Cheesecake. Now that spells S-A-T-I-S-F-A-C-T-I-O-N in my book! 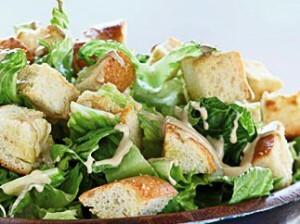 You cannot go wrong serving Caesar Salad anytime – especially as a prelude to a juicy steak! I love making my Caesar salad from scratch and the one advantage I have is that we live petty much in farmer’s country with easy access to just picked and deliciously fresh romaine lettuce. The other thing I demand on doing is making my own dressing with lots of garlic – to me, the right Caesar salad is the one you can smell from at least 20 feet away. And I can also tell you a little secret that an old Italian friend of mine told me: put croutons into your Caesar bowl (did you know you need to have a wooden bowl designated for this?) and pour your dressing over them. Then add lettuce in portions which you sprinkle with Parmesan cheese and gently toss with your hands. Repeat until you have added all your lettuce, then sprinkle generously over the top, add bacon pieces (freshly made of course) and you are ready to serve! These baked potatoes will take you less than 30 minutes to prepare and the secret here is not only cheddar cheese, but a touch of Dijon mustard – just give the potato a little bit more of what we call – a kick! There are so many ways to prepare corn on the cob – you don’t just have to throw it into a ot of boiling water (but if you do, try adding a little sugar to the water – it will give your corn a nice sweet taste) First – find out what to look for when you are choosing your corn and than consider making it a Pepper Corn of Mexican Mayo variation. You will be pleasantly surprised at the result! Some guys like their desserts sweet, sweet, sweet – and others do prefer tart, citrus taste. Well – this triple citrus cheesecake has the mixture of those tastes – the combination of lemon, lime and orange results in a beautiful citrus taste and this cheesecake is incredibly light – they will come for seconds without a doubt! Have you decided what you going to make for that special dad in your life this Father’s Day yet ? I know that there are guys who love a bit of gourmet touch to their dinner – so if that is what you are planning, you can find complete menu with recipe on this site. Just check out Complete Father’s Day Menu – it’s is looking pretty comlex, but believe me, all the recipes are easy and fully tested to succeed. You will treat you special guy to salad first – and Seven Layer Salad is almost a meal in itself, so make sure he doesn’t have a huge plate of it – there is a whole lot more to come! Appetizer would be the next item on the menu and I highly recommend Chili Barbecue Shrimp. This recipe is fast and easy for sure and the result is delicious shrimp with a bit of kick to it – just the way men like it! And what would that special Father’s Day dinner be without a nice, big, juicy steak? The one and only – T-Bone Steak, grilled to perfection. And of course – there has to be something to go with it – try French Fries with Mustard Mayonnaise and Steamed Green Beans – you can’t go wrong here. I am pretty sure you will have to give dad a little break at this point of the feast – but be ready to serve dessert shortly. Chocolate Strawberry Shortcake will not be refused! You will probably need to add a cup of freshly made coffee and then just watch that smile of satisfaction on dad’s face! Have a wonderful Father’s Day celebration and please send in your comments, suggestions and experiences, your input is always welcomed and very much appreciated!